In view of our rights in terms of branding and trademark protection we impose the following rules on customers we supply. a) If selling online their website meets a minimum standard in terms of quality and clarity of proposition. b) Brand accreditation should always be Rex London. Displayed in either product title or description text and if applicable website category under brands. c) Products should not be left unbranded or inferred to be your own design or branding. That our goods are not to be resold on third party websites such as ebay, Amazon or flash sale websites. We require our customers “bricks and mortar” premises are appropriate to the selling and display of our products. All products have a minimum order quantity as shown next to the item. Products can only be ordered in multiples of the minimum quantity. If you add a quantity to the basket that is not within that criteria a message will appear asking you to correct before proceeding. Break price (discounted price) applies when selecting a higher quantity. This quantity is individual to each product and is clearly stated. Descriptions are based on our own interpretation, as are names of ranges. If you click on a product you will be able to see it in greater detail and where possible, measurements. All product images are taken in-house and are of the actual products. However, due to various screen limitations and personal PC settings, there may be slight colour variation. It is also possible that further deliveries of stock may vary in colour, assortment and packaging. If this occurs we will try to inform you when you place your order and update our pictures to reflect changes. Existing customers may use and download our " cut out " white background images via the " download high res images function in the my account section once logged in. Unauthorised downloading, copying of our lifestyle images is considered a breach of copyright as determined in our terms and conditions. Legal action will ensue where necessary. Due to the recent extension there are no current changes to the easy trading arrangements between UK and EU until October 31. 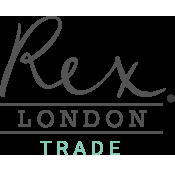 In the event of any changes please be assured that Rex London has been trading for almost 40 years and is committed to our existing and new customers in Europe. The majority of our business is export. We would like to re-assure you that whatever the political outcome we will continue to supply you in the efficient manner you are accustomed to. There will be no price increases in 2019. In the event of any new tariffs being imposed these will be absorbed and paid for by Rex London. Any new customs regulatory paperwork will be administered by us prior to delivery. In the event that logistical/customs issues cause unacceptable delays to our deliveries, we have arranged to move our European distribution warehouse to within the EU.